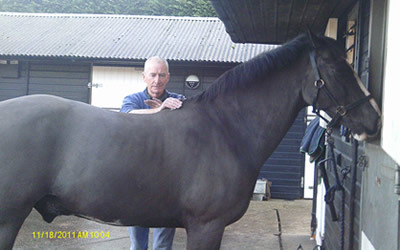 As an equine chiropractor with many years’ experience, Steve believes there is no better way of keeping your horse’s back healthy than chiropractic treatment. During the course of a year he assesses and treats a wide range of breeds, including thoroughbreds, hunters, Shires, Irish Sports Horses, cobs, Arabs, and every make and shape of pony you care to mention! Whatever the breed, horses respond positively to chiropractic therapy. Chiropractic theory is based on a neurophysiological model. Chiropractors believe that problems with the joints of the spine are the result of a functional disturbance of the nervous system. When a joint suffers trauma, the muscles around it will go into spasm, restricting the movement of the joint. The relentless neural bombardment that maintains the spasm is a disturbance of the muscle’s neurological control mechanism. The aim of chiropractic adjustment is to rebalance the spinal joints, thereby removing interference with nerve transmission and modifying the neurological message given to the muscle. Tension in the soft tissue around the joint, including muscle, fascia, ligament and nerve tissue, is released, and normal movement is restored to the joint. The principle of innate healing is central to chiropractic philosophy. Chiropractic adjustments, by removing interference with nerve transmission, allow full expression of the body’s innate healing ability. What can I expect from an equine chiropractic assessment and treatment? First of all Steve will take a history from you as the owner, in order to determine what may have contributed to the horse’s current problems. Your input is often extremely important in deciding how to proceed. Please note, however, that a chiropractor cannot, by law, make a diagnosis. Only a vet can do that. Then, with the horse standing square, Steve will assess his (or her) weight distribution, muscle development, and vertebral alignment. The next stage involves movement analysis. Steve watches the horse walk and trot away from him, towards him, and from the side. He wants to see, for example, if the horse’s hooves land flat, if his limbs move straight, if his joints are lifted to an equal height on either side, and if his tail is carried straight. Then he watches as the horse turns in a tight circle in both directions. Is he flexing through his neck and body? Is he stepping under himself correctly with his hind legs? Finally, he watches the horse back up. Does he take positive steps back, or is he resistant, with his head up and back tensed? After this visual assessment Steve carries out a hands-on assessment of every aspect of the horse’s spine and joints: starting with the head and neck, then forelegs and shoulders, withers, thoracic spine, lumbar spine, pelvis, hind legs and tail. He is assessing such things as range of motion in the joints, variations in temperature in the surrounding soft issue, muscle tone, and sensitivity. The horse’s reaction to his hands-on assessment provides further information. On the basis of these assessments he makes chiropractic adjustments to the horse’s spine and joints. These take various forms, but typically involve high velocity, low amplitude impulses, or thrusts, into the plane of the joint. The aim is to realign or rebalance the joint, release the tension in the soft tissue surrounding it and to normalise joint function. As well as playing an important role in alleviating pain and discomfort in the horse’s spine and joints, regular chiropractic care of the healthy back will prevent problems from developing. A full treatment once every six months is usually enough to keep the spine correctly balanced and joints working efficiently.